(NEW YORK, NY) – Quantum Creative Studios’ CEO Jayson Raitt and Luce Group’s Founder Traci Klainer today announced the partial acquisition of Luce Group by Quantum Creative Studios and the formation of a formal strategic partnership between the two companies. Quantum Creative Studios recently completed work on the premiere of the new production show “The Secret Silk” in collaboration with Princess Cruises and their partnership with Stephen Schwartz (Oscar-, Tony- and Grammy award-winning composer of “Wicked,” “Pippin,” and “Godspell”). Jayson Raitt, Creative Producer of Quantum, served as the show’s Supervising Producer, and Quantum’s Chief Creative Director, Kelly Easterling, served as the show’s Lighting Designer. Veteran lighting designer Kelly Easterling of Quantum Creative Studios recently deployed Martin by Harman MAC Encore Performance fixtures to create an intricate lighting design for The Secret Silk, a Broadway-style musical which debuted on the Princess Cruises ship Royal Princess in February. The Secret Silk was brought to life by a talented team of industry veterans, including director John Tartaglia, executive producer Stephen Schwartz (creator of Wicked, Pippin, and Godspell) and supervising producer Jayson Raitt from Quantum Creative Studios. The stunning set design was created by three-time Tony Award nominee Anna Louizos, with lighting design by Easterling, video and projection design by Aaron Rhyne, costumes by Tony Award-winner Clint Ramos, and animal puppets created by the Jim Henson Creature Shop. Kelly Easterling has been part of our industry for many years but only became active within the Themed Entertainment Association (TEA) around the year 2011. His exposure to TEA led to forming his present company, Quantum Creative Studios, with partner Jayson Raitt. Kelly Easterling's rich and varied career is a prime example of a person in the entertainment and design business in continuous pursuit of his passion. His huge appetite for creativity is reflected in the many places he has worked, the different types of positions he has held and the range of projects. Every building, park, attraction, and venue is more than just architecture or a destination; each should tell a story. Experiences and environments must not only fulfill a functional and physical pre-requisite, but also touch guests emotionally and leave a lasting impression. Jayson Raitt, Principal Experience Producer/Storyteller, Quantum Creative Studios. The iconic Cunard Line was looking for a way to celebrate the 175th anniversary of its first transatlantic crossing, when Kelly Easterling approached the company with an idea that was outside the box — or perhaps more aptly outside the ship! 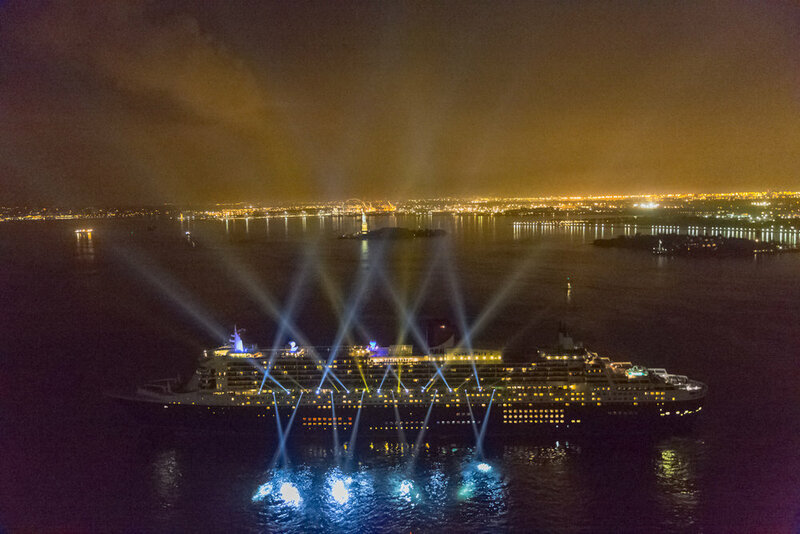 Easterling, the creative director and principal designer at Quantum Theatricals, proposed creating a dynamic light-show set to music off the side of the 1,132’ Queen Mary 2, the company’s flagship ocean liner. Much to the delight of the massive crowd in New York harbor on July 14, this is precisely what he and his dedicated team wound up doing with help from 50 intensely bright Legend 230SR Beams from CHAUVET Professional. Quantum Creative Studios - Sparking Imagination through truly creative concepts and storytelling.